A note from your District Editor In this issue, we put a heavy emphasis on building our district. In order for our district to thrive and improve, it is vital that we have strong attendance at district-wide events. Thus, there are numerous articles in this issue about these wonderful events. Hello members of the New Jersey District! I’m Eric Wang, your District Editor, and it is my pleasure to introduce to you the first issue of the seventy second volume of The Jersey Key! Of course, our district would be nothing without each of the individual clubs that it’s made up of. I’ve included many club spotlights in here featuring the great service that you do. To have your club featured in the next issue, simply email me at editor.wang@njkeyclub.org and I’ll be happy to work with you! 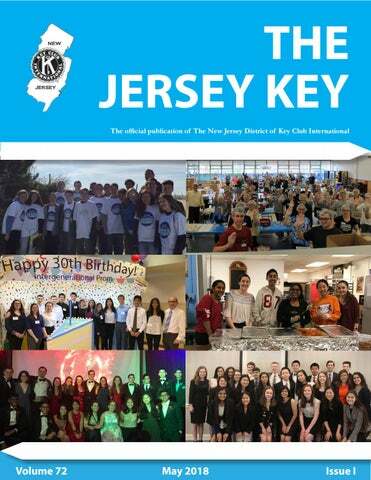 As the official publication of our district, The Jersey Key contains many helpful and interesting articles written by our very own District Board members, officers, and general members. Although it took much time to plan, edit, and publish this issue, I throughly enjoyed the process. I hope that you experience some of that same enjoyment while reading this issue! I am absolutely honored to be speaking to you all today as your District Governor. If you were unable to meet me at our amazing District Convention, I am Frank D’Agostino. Currently, I am a Junior at the Marine Academy of Technology and Environmental Science, more commonly referred to as MATES. I began my Key Club experience not really understanding what it would entail. It was just another club I joined, and that was that. But Key Club was difference. I began by helping out at an event, and then another, and then another. Eventually, I ended up at a Regional Training Conference, where I met other Key Clubbers and met the District Board. ger in New Jersey, we will work towards eliminating hunger in our state so 1 in 7 people do not have to be food insecure. With our advocacy focus, we will work to raise awareness of sexual harassment and to prevent it in all facets of life. We have a lot of work ahead of us, but I know we can do it if we all work together. One district, one division, one club, and one member is all it takes. I look forward to working with each and every one of you, and I thank you for taking the time to read through our first edition of the Jersey Key. I am certainly excited! As always, feel free to reach out to me at any time with any comments, questions, or concerns you may have, as I will always be here! You can contact me at governor.dagostino@njkeyclub.org. With that, I will be seeing you all at Regional Training Conferences and Fall Rally next! This service year had many ups and downs. We did more service and fundraising than in years past and surpassed our district goals for Hunger in New Jersey. Our membership attendance was down at district events in and clubs. What can we learn from this? What can we replicate that other strong clubs are doing- the Jersey Key or DCMs are a great way to hear more about what other groups are doing. Your LTG can be a great resource in brainstorming ideas to help you move forward. 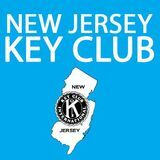 Visit www.njkeyclub. org to get ideas for projects, learn about upcoming dates, and obtain contact information for the district board. As you begin a fresh start this May/June, let us help you become even better going forward. New clubs, new members, new projects and new ideas are what will help us change the world one child and one community at a time. some awards, and serve as host club, but so sad that it was my last one. I’ll miss it.” JC is thankful for his experience with Key Club. He said, “Key Club is what got me through high school. The friends I was able to make, the experiences I had, and all the fun throughout the four years made joining Key Club one of the best decisions I’ve ever made.” Brick Memorial truly did a splendiferous job as host club. Their dedication and hard work really shone through in the decorations. Thank you to all the members, JC, and Miss Tarnowski for helping to create lasting memories at DCON 2018! to laughter and tears throughout his entire presentation, where he adopted four different personas to show us the importance of understanding others. He truly inspired us to take care of our home, schools, and communities. As tradition in Key Club, before the Keynote Session was adjourned, the divisions competed against each other to win the spirit stick, a prize given to the most enthusiastic division. Many tributes cheered passionately for their divisions to win the coveted prize. Following the Keynote Session, candidates campaigned for positions on the District Board and International Board in the caucuses. These hardworking candidates fought valiantly to connect to voters by chanting, cheering, giving impressive speeches, and even handing out candy! After two hours of caucusing, we ended a long and eventful day with the Friday night dance where tributes danced the night away to their favorite songs. What a great way to unwind! Blair of Division 3,Lauren Quadir of Division 4, Arun Mandesha of Division 5, Emma Ke of Division 6, Abbie Chan of Division 7, Sarah Jacob of Division 8, Katie Lynch of Division 9, Surabhi Karambelkar of Division 10, Maiya Debare of Division 11, Ian Fischer Division 12, Gillian Bayne of Division 13, Hemani Patel of Division 14, April Wang of Division 15, Edward Hou of Division 16, Summer Ahmed of Division 17, Joseph Kajon of Division 18 Katrina Pham of Division 19, Kyla Hunter of Division 20, Eliana Koenigsburg of Division 21, and Olivia Oâ&#x20AC;&#x2122;Brien of Division 22. Ellie Hulit and Cindy Lam are our Lieutenant Governors at Large. After intense chants, people losing their voice, and backflips, Division 17 won the final battle for the Spirit Stick and had the opportunity to bring it back home. Thank you all for a lovely 17-18 service year! Bloom in service at Regional Training Conferences! theme is Blooming in Service, so expect to see a lot of flowers, vegetables, and other nature-related decorations! Treasurer, Editor, and Webmaster. The general member workshop focuses on the jobs of a Key Clubber throughout the year such as attending events like Fall Rally and District Convention. The role of the general member is to participate in as many Key Club events as possible to learn about service as well as leadership. strongly encouraged to come––each officer is required attend at least one RTC during his/her term in order to be distinguished at the end of the year at District Convention. Each club is recommended to send at least one Key Club member/ officer to its nearest Regional Training Conference, but the more the merrier! Why Should I Go to RTC’s? Regional Training Conferences are genuinely really fun since you get to meet executive boards of other Key Clubs. You can learn from them and they can learn from you! This is a great event to socialize with other individuals in the same boat as you and meet new people. We include icebreakers that are really enjoyable and breakfast that is free! The food is amazing and it this event truly is the time to show your Key Club spirit with your fellow Key Clubbers! District Webmaster the Spirit Stick. Members will be able to see everyone from around New Jersey and have a load of fun at Six Flags. Key Club members can expect to participate in an hour long assembly to hear about Key Club and soak in everything from our largest district event all year. Then, the attendees will be able to go off on their own for the rest of the day and enjoy the park. This will not only give Key Club members a glimpse of district activities and updates and share ideas about service, but it will also allow them to have a day of fun with their existing and new friends. Fall Rally is scheduled for Sunday, October 7, at Six Flags Great Adventure. Tickets are $40 for early registration, $45 for on-site registration, and $7 for season pass holders. Early registration is September 28, 2018 and on-site registration is available on October 7, 2018 from 7:30 am - 9:15 am. Start planning transportation and fundraising now, whether it’s by hosting fun events like volleyball tournaments or by partnering with a restaurant to earn a percentage of the profit. Don’t forget nonperishable food items for our food drive, which will help contribute to ending Hunger in NJ! See you at Six Flags to solve the mystery! International is now offering a platform that uses email and social media to raise money for your service and fundraising projects. Kiwanis Gives Online will allow all of our Kiwanis sponsored club members to ask friends and family for online donations, no matter where they live. Kiwanis Gives Online is similar to donation sites such as Go Fund Me. them at your local Chipotle, Receive a flyer for your fundraiser, tell your friends and supporters, and keep up to 50% of the proceeds from people who show the flyer (that’s a lot!). Before the fundraiser starts, ask Chipotle to approve the date and time. Krispy Kreme offers their doughnuts to non-profit groups at a reduced price, which are then resold for full retail price, or slightly higher. Pre-selling doughnuts to family, friends and neighbors or selling doughnuts at high-traffic areas such as shopping centers or community festivals can generate significant funds. Sale Fundraiser sells roses for $20 per dozen roses. $12 goes towards the Kiwanis District Foundation, and YOUR Key Club gets $8! The order includes the roses, a card on how to take care of the roses, a box, a gold band around the box, and green paper on the box. Orders must be sent by September 4th so be sure to contact your LTG ahead of time. This is a great way to fundraise during summer! any local businesses would be happy to help out with a fundraiser. Businesses host their fundraisers in different ways, so make sure to reach out to them! Each year the New Jersey District Board votes on a new District Project to be the service focus of the next year. This cause becomes the overarching goal that all fundraising and collection efforts are geared towards. hours. At the May Board meeting, new goals have been set in the hopes on continuing the upward trajectory of the past few years. The goals for this service year are $65,000 in fundraising, 58,000 pounds of food and 25,000 service hours. This year, the New Jersey District has chosen to continue with Hunger in New Jersey as the district project. This choice was inspired by the seriousness and prevalence of this cause, as well as the success our district has had with this cause in previous service years. One of the main focuses of the DPS committee is organizing a district event to gather support and contributions from Key Clubbers across New Jersey in a fun-filled, action-packed event. This year, the DPS Committee plans to continue the beloved volleyball tournament tradition. More than just an exciting opportunity to show your division pride, this event is critical a critical boost to helping the district meet the ambitious goals. Make sure to look out for food drives at other district events such as the upcoming Fall Rally. Hunger is an prevalent epidemic across the world; however, it is often overlooked as a widespread issue that pervades our own state of New Jersey. The fact remains that 13% of people in New Jersey are food insecure, translating to roughly 1 million residents. The statistics are even more troubling regarding children: 1 in 6 children in New Jersey struggle with hunger. Volleyball tournaments, or other events such as movie nights, dance-a-thons or color runs, are also encouraged as divisional events to raise awareness about Hunger in New Jersey on a smaller level. The individual schools and general members play a critical role in ensuring that Key Club is able to maximize the positive impact on the community. As the co-chairs of the District Project Steering Committee, we look forward to pursuing our goals and ultimately working with all the other dedicated members of Key Club to make a positive change combating Hunger in New Jersey. hearing candidate speeches, asking them questions, and being a delegate from your school at the Nomination Conference and at House of Delegates. We have three Key Clubbers from New Jersey running for International positions this year, and our district could not be more proud. Come support Madeleine Eichorn and Zachary Patterson as they run to be International Trustees and Hannah Nivar in her campaign to be International Vice President. Attending ICON is a life-changing experience that New Jersey Key Clubbers benefit from throughout their terms. It is a great opportunity to see how people from all around the world are related through Key Club. Come join the fun in Chicago! Each year, the Lower Cape May Regional Key Club organizes a community event called Haunted High School. We spend six hours after school preparing the hallways to create a spooky tone as your make your way throughout the school. We also collaborate with other clubs when decorating to make the stress level go down. Then after finishing the final touches, our club set up stations throughout our school for children to receive candy. In addition to decorating, we set up a bouncy house in the gym for children to relax and have a fun time instead of walking around repeatedly. In the end, the reason why we volunteer to do this every year is because seeing the community come out for this one night is amazing. Almost 1,000 people come each year to the one-night event. Not only are the parents happy because their child believes that everything is real, but the children are happy because they are having the time of their lives. Seeing their faces light up as they see familiar characters when we dress up is all our Key Club needs to know that we are doing the right thing for our homes, schools, and communities. It’s not about receiving community service hours, but it is about making memories that we will never forget and giving back. of macaroni and cheese meals. It was a truly rewarding experience: I was able to meet and serve with many Key Club and Kiwanis members from other schools. To package so many meals and see the many boxes of meals being picked up by the humongous trucks of various food banks in NJ served not only to instill me with the feelings of pride and accomplishment, but also as a reminder of how many people in NJ are hungry. I am so privileged to have been a part of this tremendous event, and I look forward to participating again next year! Veterans Memorial Elementary School. It was also a success because it showed the great teamwork our key club had with Point Beach Key Club in order to reach our goal,” said Alyssa. Not only that, but Alyssa commented that, “Next time our club does a book drive I would like to put the word out to every Key Club in our division to gain support from each member and grow a better bond between all of our clubs.” Overall, the book drive was an amazing success! Incoming kindergarteners will be prepared to read thanks to everyone to contributed, from getting the word out to donating old books. This was a great service event between Key Clubs, and we recommend hosting a book drive to other Key Clubs! bers volunteered to serve the tasty food and beverages. The pleasant dinner included baked ziti with meatballs, salad, dinner rolls, water, iced tea, coffee, and cookies (for dessert). Although the volunteers at the site of the event were definitely crucial, the hour long event would not have been achievable without the generous donations from multiple other Key Clubbers. Donations such as paper goods, pasta sauce, and cookies absolutely played a great role in the professionalism that we were able to provide to our guests. The dinner theater was undoubtedly a marvelous way for the PHHS Key Club to be able to connect with the senior citizens of the community and end the day with many smiles, lots of joy, and a ton of service! On April 19, Mountain Lakes High School hosted the second annual International Night. All proceeds from the fundraiser went towards Water.org to help empower people with access to safe water and sanitation. The event was a multicultural night of festivities that brought the community together to celebrate diversity. Local cultural restaurants donated an extensive spread of ethnic foods arranged in a buffet for students to enjoy. The gym was decked out in decorations with flags from foreign countries and globe balloons, and the school jazz bands performed culturally-inspired selections. Overall, the event raised over $800 for Water. org and delivered an unforgettable night for members of the community. purpose of these letters were for people to circle whichever pizzeria they thought they liked the best. At the end, the pizzeria with the most votes were decided and it was a great night. Kiwanis invited the John P. Stevens Key Club and Edison High School Key Club to participate as the Kiwanis club in charge of this event sponsored both clubs. All clubs from Division 14 were invited to participate. Large amount of vanilla, strawberry, and chocolate ice cream with various amounts of toppings were served after along with fruits and drinks. We raised a lot of money and the event was a huge success! This past Sunday, April 29th The Voorhees Key Club joined the March of Dimes in their annual March for Babies where participants walked a 1k at the Spruce Run Reservoir In Clinton, NJ. March of Dimes is a United States nonprofit organization that works to improve the health of mothers and babies by preventing birth defects, premature birth and infant mortality. At this event, we ran the different stations and games as well as greeted the participants. This service project was one of the most inspiring and memorable events for our club. It was amazing to hear stories as well be apart of such an amazing movement. This is definitely an event that the VHS Key Club will never forget! the shoes of those in need. Attendees carried gallon jugs of water and walked a path around Sandy Hook, experiencing a fraction of what it’s like to have to walk for water every day. The event also involved an obstacle course and additional information about the Thirst Project’s cause. Through these two events and other small projects earlier in the year, the MAST Key Club has raised approximately $7,000 to benefit the Thirst Project—over halfway to the goal of building a well! The MAST Key Club officers and Thirst Project committee couldn’t be prouder of all the work Key Clubbers, advisors, and fellow MAST students have done to make progress towards the goal. Here’s looking forward to a few more successful projects and a well sometime in the near future!